Published: February 13th, 2019 by Simon. Filed in Bathroom and tagged shower enclosures, Showers, Walk-in Showers. In recent years, walk-in showers and shower enclosures have become a desirable part of bathroom design. Not only do wet rooms add space and luxury to bathrooms, but they also add great value to a home. Whether you’re upgrading your bathroom or building a new home, there’s a good chance that you’ll also want a walk-in shower or shower enclosure included in your design. However, to choose between the two, you’ll need to know a little more about each option. Today, we’ll take a closer look and compare walk-in showers to shower enclosures. Hopefully, when you’re done reading this post, you’ll understand the difference between these two types of wet rooms and be able to make a more informed choice for your bathroom design. Walk-in showers are essentially shower rooms without the shower screen or the shower tree. Unlike traditional shower enclosures, they don’t have any doors or large glass panels. Rather, the entire shower area is open and fully tiled. Walk-in showers look incredibly stylish and contemporary, and they are great for bathrooms of all sizes. In tight spaces, shower screens can be used with a walk-in shower to prevent water from spraying all over the bathroom. Removing the bath area and keeping the shower space open frees up a lot more space as well. In general, it is easier to clean and maintain a walk-in shower than it is a shower enclosure. This is because there are no doors or large glass panels to clean. If you include a wall hung vanity and toilet suite in your space, then it will be even easier to clean and maintain. Also, the flooring under walk-in showers is better protected than standard shower enclosures. If you’d like to go with a walk-in shower for your new or renovated bathroom, then you’ll find just what you’re looking for here at Ross’s Discount Home Centre. Take a look at our Frost Shower Panel and our Cannes Shower Screen. Either of these products will allow you to create the wet room of your dreams in your space. Shower enclosures are the traditional type of wet rooms. They consist of a framed or frameless glass panel which encloses the shower area. Framed glass panels usually make use of an aluminium frame to holds the panels in place. On the other hand, frameless glass panels are held in place with the help of hinges and bolts. Shower enclosures are a better choice for small bathrooms. This is because the glass panels prevent water from spraying beyond the shower space. Because of this, bathrooms with shower enclosures do not need as strict waterproofing requirements as walk-in showers. With shower enclosures, you can use different tiles on your floors and walls to create a unique look. Whereas, same cannot be said about walk-in showers; the one tile is used throughout the space to create a consistent look. In general, a shower enclosure is the more affordable, and more traditional, choice. For an extensive range of shower enclosures in Perth, you needn’t look any further than us at Ross’s Discount Home Centre. Check out our range of Brighton Showers and our Torquay Square Slider Shower. Either of these is excellent choices for your new shower enclosure. If you’re considering adding a wet room to your bathroom, you can go with a walk-in shower or a shower enclosure. Shower enclosures are the traditional type of wet rooms which include a shower area enclosed with glass panels. 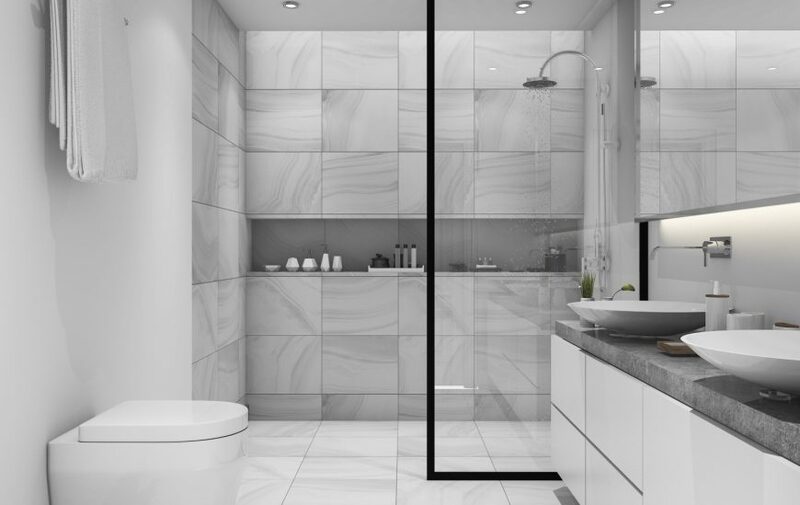 On the other hand, walk-in showers are open shower areas which do not include a shower tray or glass panels – they are more luxurious and modern. Walk-in showers are also easier to clean and maintain and are suitable for bathrooms of all sizes. Shower enclosures, on the other hand, are more affordable and are better suited for smaller bathrooms as they prevent excess spraying of water. Regardless of whether you choose to go with a walk-in shower or a shower enclosure, you’ll find just the shower style you need here at Ross’s Discount Home Centre. To take a look at our range of quality showers in Perth, pay our showroom in Guildford a visit or shop from our online store today! 6 Lakes Bathrooms Showers You'll Love!